you can easily add border to your images in Blogger, without adding border standout in your content. it is very simple and can be done easily but new bloggers find it some difficult to add this in our blogger blog. 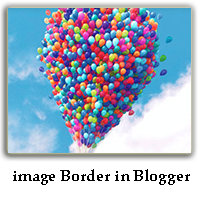 In this posts, i will show you how to add border around an image in blogger. To add border around images you need to write simple codes of (CSS). With these codes you can easily add many different kinds of borders having any colors that you want in your border area. 5: Paste below code above the (b:skin) tag. you also change the #FFA600 with any other color code to change the color of your border. You can also increase the above 3px to a higher or small number to increase the blank space around the border 4px in your blog. you can use different types of borders in your images to your your border. (solid, dotted, dashed, double, groove, ridge, inset, outset). The effect depends on the border color value. after you done! customizing your image border, now press the (Save Template) button and save your template.